The Nordic Ware waffle iron makes Belgian-style waffles on the stovetop. Made of cast metal, it has an old-fashioned manual design -- with the modern addition of a nonstick coating -- and uses no electricity on its own. Before using the waffler, wash gently in hot water with mild soap. 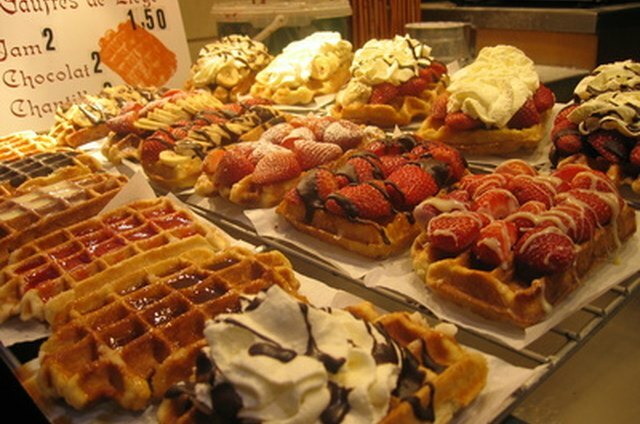 You'll need a good recipe for Belgian waffles -- use the recipe that comes with the waffler or find another. Spray the inside of the waffle iron with cooking spray. Turn a large stovetop burner to medium heat. Place the waffle iron on the burner and heat for about three minutes. Turn over and heat the other side for three minutes. Open the waffle iron an pour about 1 1/4 cups Belgian waffle batter into the center of one side. Close quickly and cook about 45 seconds. Flip the waffle iron over and cook until steam stops coming from the iron. Waffles should take three to four minutes to fully bake and should be golden brown when done. Remove the waffle iron from the heat and open. Use a fork to pop the waffle out of the iron, and place it on a plate. 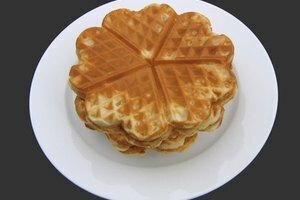 The waffle should come out easily if the recipe was followed and the iron was properly heated before adding the batter. Place the waffle iron back on the heat with the same side touching the burner as when you finished the previous waffle. Repeat the process for cooking more waffles. Making perfect Belgian waffles takes practice. Adjust cooking times and heat levels until you have the desired results -- but don't increase the heat above medium. Waffle batter can be made the night before. Use all of the batter. 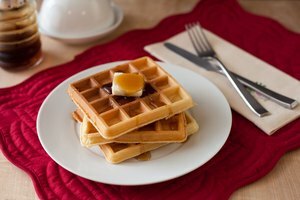 Leftover waffles can be reheated in the microwave or oven. If waffles stick badly even when the heating and recipe instructions are followed, add a couple of tsp. cooking oil to the batter. The waffle iron will be very hot when in use. Never touch any surface of the hot iron other than the handles.